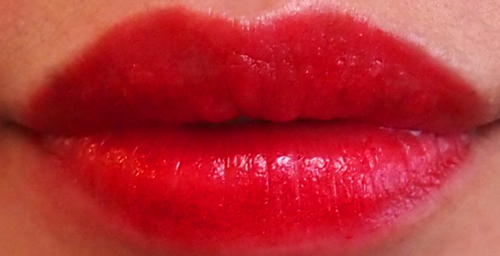 Since today is Valentine's Day and I didn't have time for a themed manicure this year (some previous examples here and here), I thought I'd share an equally as appropriate red lippie instead: Arbonne Lipstick in Strawberry (#7879). I have heard good things about Arbonne from friends who use their skincare products but this lipstick sent to me by their PR has been my first introduction to the brand. I like the slim matte black packaging a lot, since it looks quite sleek in the tube. Made with wild mango butter, aloe barbadensis leaf extract, pomegranate extract, the formula is hydrating and smooth with a shiny finish. I would recommend a lip liner for a crisp line (I am not wearing one in my swatch below), though I should note that Arbonne does claim the product is feather resistant. At $31 CAD, this product is not cheap but is a good option if you're looking for a blue-based red that is easy-to-wear yet bold at the same time. I personally rarely wear red lipstick, and when I do, I prefer a more matte look. Thankfully Arbonne also has thirteen other shades to choose from! Such a pretty shade! 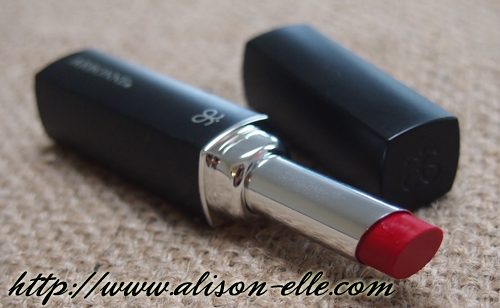 I've never heard of Arbonne before but this lipstick sounds lovely. I like how the lipstick is so shiny! Although that is getting up there in the price range!